Thrush, author of the 2008 volume “Native Seattle,” is clear about his aim for both books. By showing us how Inuit, Ojibwe, Maori, Salish and other peoples interacted with and viewed the seat of the former British Empire, Thrush hopes to “indigenize” an urban center whose history is often portrayed as mutually exclusive from the experience of the native inhabitants the British Empire came into contact with and, quite often, suppressed. 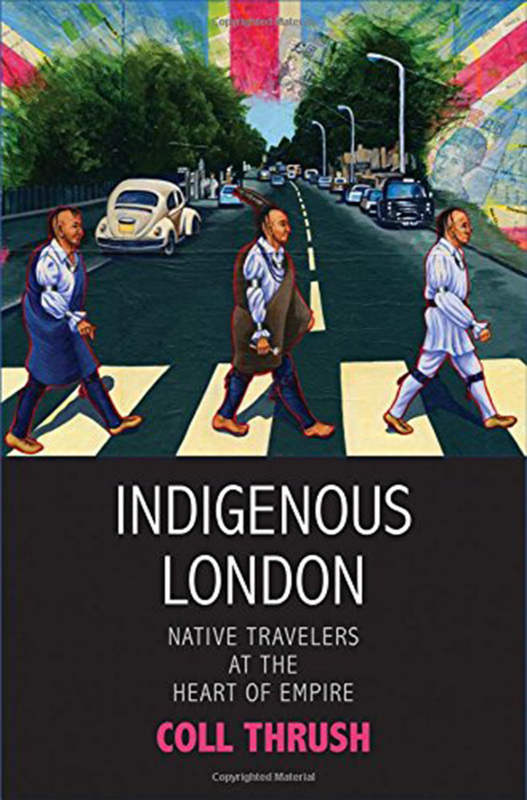 In doing so, he demonstrates the many ways in which visits to London by indigenous peoples from Britain’s far-flung colonies exposed, challenged and reinforced Western European ideas about race, masculinity, colonization and “civilized” society. He also reminds us of the painful context in which these visitors experienced London -- back home in North America and the South Pacific, British subjects and white settlers driven by a thirst for expansion posed a constant threat to native lands and ways of life. Leaders from these communities often came to London to plead on behalf of their people and assert their own authority. Here, the occupiers come face to face with the occupied in their own teeming capital by the Thames. They are by turns dazzled and horrified by these exotic-looking visitors with their animal-skin clothes, dramatic dances and chants. But even as Londoners pack into special shows and exhibitions featuring tribal performers in traditional dress, their anxieties and insecurities bubble to the surface. Social observers and journalists, for instance, openly fret over the possibility that the city's upstanding women will start to favor the dark-skinned men from the edges of empire to the white men of Britain. For their part, the visitors are just as dazzled and horrified by what they see. Thrush peppers his book with quotes from indigenous visitors with strong opinions about the smoggy, chaotic, overcrowded and fetid London of the 19th century. They seem especially shocked by the crushing poverty on display among the working classes there -- and Londoners’ tolerance of such inequity. However, some weave themselves into London’s urban fabric by staying for extended periods, becoming savvy fixtures in high society or performing on the entertainment circuit. Queen Emma of Hawaii, for example, proves to be a master of the protocols, manners and Christian sensibilities of Victorian England while also promoting the interests of her South Pacific kingdom in London in the 1860s. Still, one can’t read this book without taking to heart Thrush's repeated warning about the backdrop against which indigenous visitors -- tribal leaders, show performers and athletes alike -- encounter London. They are almost always viewed as the living relics of a more primitive and savage time set lose in a modern metropolis, people to be gawked at, studied and improved upon. They are seen as vestiges on the verge of extinction, despite their continued (though diminished) presence in ancestral lands and their obvious fortitude, cultural relevance and vitality. Thrush details some remarkable scenes from 1800s London: A manager at a performance of “Macbeth” forcing four Mohawk and Mahican kings to sit on the stage so that curious Londoners could watch them watching Shakespeare. Maori rugby players competing against British teams in London’s suburbs. Lakota horsemen re-enacting attacks on wagon trains and white settlers’ cabins in Buffalo Bill’s Wild West Show, attended by millions in the city. At each turn, though, Thrush flips the script, as well as the power dynamic, to show what happens when the objects of an empire‘s gaze dare to gaze back.